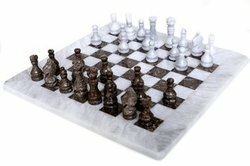 We are offering Marble Chess Board. Fine square shape marble chess set with nice carved coins. chess available in each size. Fine Marble Chess Set, made by wooden and marble. We have all different size's in this. - Chess pieces and board made in stone. - Pieces hand-carved by artisans of Jaipur. - Box top in stone and used as board. -12 inches Very Fyn Piece made by indian craftsmen whose forefathers are involved in making of tajmahal. Our company is amidst leading Marble Chess Set Manufacturers and Suppliers in Agra. 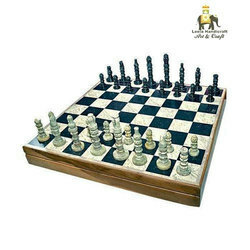 The Marble Chess Set which we offer is made from the fine quality marble stone. The Marble Chess Set provided by us is acknowledged for its smooth texture and excellent finishing. The unique design and refreshing color combinations, add a new life to the appearance of these Marble Chess Sets. We are a known name in the market engaged in offering a quality range of Marble Chess Board at attractive price range.